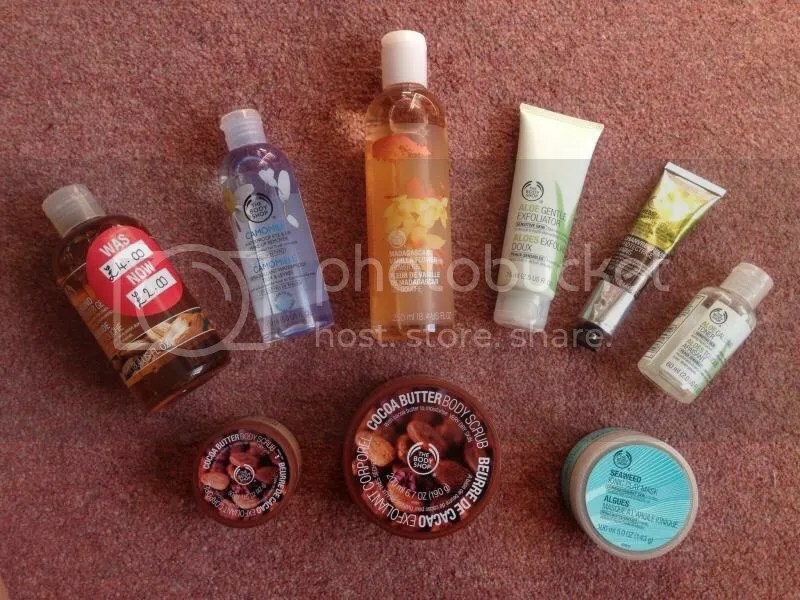 A Body Shop Haul! | Becky Alyssa's Beauty Box. The No-Buy August is over! Yes it was tough, but I think I’ve learned to be a little more discriminating when it comes to my beauty purchases. I’ve also noticed my bank balance has significantly improved over the last few weeks, which is certainly nothing to complain about! To celebrate the end of the month and the end of the No-Buy, I decided to take advantage of a recent 40% off offer at the particular Body Shop store I happened to visit. There’s a few of their products I’ve been meaning to try for a while, as well as stock up on a couple of travel essentials to take to the US next week. After paying £5 for a Love Your Body membership, everything in store was 40% off, including sale and gift box items. I believe this is a fairly regular event, so if your local store is advertising the discount for the day it’s worth stocking up on your favourites! Here’s what I picked up..
1. Almond Shower Gel – I spotted this on the sale shelf and had to try it out – since I’ve recently developed a weird allergy to regular ‘chemical’ shower gels, I’ve been sampling some of the more natural ones. And this smells gorgeous – can’t wait to try it! 2. Camomile Waterproof Eye & Lip Makeup Remover – After nearing the end of my Simple eye makeup remover that seems to have lasted years and isn’t anything more than average, I decided to try this one after reading a couple of positive reviews. A little different from my regular eye makeup removers – since it consists of a mix of oil and water, it has to be shaken before using. Hoping this gets rid of those last traces of stubborn mascara ! 3. Madagascan Vanilla Flower Shower Gel – Another shower gel! I actually received this free with my purchase – I wouldn’t have immediately picked it up in the store, but it does smell wonderful. I used to be obsessed with vanilla fragrances but don’t seem to go for them as much as I used to – maybe this will change my mind again? 4. Aloe Gentle Exfoliator – The Clarisonic has been a skincare star of mine for the last 6 months, but my skin’s been a little irritated lately and I’m not sure why, so I’m giving it a break for a while. Since all the products from the Aloe range are specially formulated for sensitive skin I thought this would be an ideal temporary replacement. And if not, back to the trusty Clarisonic! 5. Hemp Hand Cream – My HG hand cream! I’ve been using this for at least 10 years now – a new record maybe? It moisturises like no other, even on the driest and scaliest of hands. This is the perfect size for bringing in my suitcase. I also adore their Hemp foot cream, a similar formula but a little thicker to soothe and soften dry and callused feet. This hand cream is one of those products I’m always recommending to anyone who will listen, so you know it’s brilliant! 6. Aloe Calming Toner – I love my Lush ‘Breath Of Fresh Air’ toner, but this tiny bottle is perfect for travelling. I’ve been sampling a few different toners lately since many of them are a little harsh and overly drying – again, this one is specifically formulated for sensitive skin so hopefully it’ll be gentle but still work effectively. 7. Cocoa Butter Body Scrub – Yes, I bought a mini and a full size of the same product! Again, the smaller one is for travel to keep my skin smooth and lovely all over while I’m away. I recently finished off the Brazil Nut scrub – this one smells similar (and absolutely delicious) plus the consistency is wonderfully creamy. Hoping this will be a new favourite! 8. Seaweed Ionic Clay Mask – I’ve been wanting to try this for what seems like forever, but the slightly steep price has always put me off, especially since I didn’t want my money to go to waste if it didn’t work for me. So the 40% off made this product much more appealling! My skin loves clay masks, they’re perfect for sucking out blocked pores and dirt (lovely!). As much as I love the Montagne Jeunesse masks, the sachet packaging can be a little messy and means it’s difficult to save some for next time. The tub packaging should keep this fresh long after the first use, perfect to keep in the cupboard for whever I need it. 9. Mineral Powder Blotting Tissues (not pictured) – Forgot to include these as I already have them stashed in my bag from using them! I’m running out of my bulk buy of the famous Clean & Clear papers so I decided to try these out instead. Honestly, I’m yet to be blown away but the super-light powder gives a matte finish without going to the hassle of carrying and applying a separate powder on the go. I’d love if the powder gave better coverage – the recent hot weather means foundation and BB creams don’t always want to stay on my face and I don’t always have time (and handbag space) to reapply these products throughout the day. I’m interested to see how these will perform in the upcoming cooler weather so I’ll hold onto them for now! Anything else from The Body Shop that’s worth trying? What do you think of these products, if you’ve tried them? & how brilliant is 40% off?! This entry was posted in Uncategorized and tagged haul. Bookmark the permalink.